When going to see your audiologist, there are a few questions you may want to ask. You don’t go see or talk to your doctor every day, so when you do get the chance to speak, it is important to be prepared, especially with your audiologist. Your normal healthcare physician, although knowledgeable, does not possess the same knowledge and expertise as your audiologist does. Be prepared, and ask your audiologist the important questions you need to know about your hearing. How Do I Properly Clean My Ears? There are plenty of misconceptions and myths about how to properly clean your ears, so it would be a good question to ask your audiologist how exactly you should go about cleaning them. You may have heard that cotton swabs cause impaction, or that a flame from a candle can completely rid your ear of any wax backup. It is easy to damage you ears while cleaning them, so ask your audiologist how to do so properly, or even have them clean your ears properly for you when you visit. While you are with you audiologist for a checkup, that is the perfect time to discuss ways to protect yourself from hearing loss. Your audiologist can help guide you to living a better lifestyle that will prolong your sense of hearing, and make sure you do not have to worry about it deteriorating in anyway. 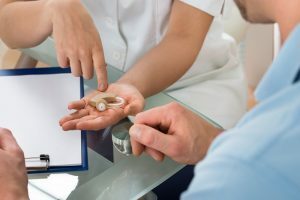 While discussing ways to protect your hearing, you audiologist can also offer you tips on what tools are designed to help protect your hearing the best, like different types of ear plugs. How Can I Tell if I Am Suffering from Hearing Loss? The fact of the matter is, on your own, you may never be able to tell you are suffering from hearing loss until it is far too late. Hearing loss occurs slowly over time, making it difficult to tell when exactly you are afflicted with it. This is why it is important to start a dialogue with your audiologist about what the warning signs of hearing loss are, and how you prevent hearing loss. Go over the symptoms and causes with your audiologist, and make sure that hearing loss is something you do not ever have to worry about happening to you. This entry was posted on Friday, January 12th, 2018 at 6:19 pm. Both comments and pings are currently closed.